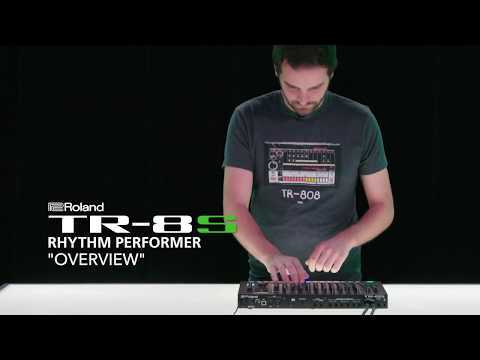 Built on the foundations of Roland's historically superb drum machines the new Roland TR-8S Rhythm Performer Drum Machine was created to be played live. With its incredible sound design capabilities, you can build and play your dream kits with hands-on controls and production tools that make your patterns burst with life. Packed with an authentic large collection of TR drum machines available and with next-generation processor, the TR-8S not only delivers classic Roland boom, snap, and sizzle but allows you to create stunning hybrid kits. Bespoke effects have been built into the TR-8S too to add layers of magic to your beats. Whilst drum sounds are at the core of your unique sound, the TR-8S not only lets you create using its own extensive collection of samples but also allows you to import your own mono or stereo sounds using an SD card slot. You can then manipulate any sounds with immediate hands-on control. Adjust decay and tuning and alter sample start points, speed, and direction. You can create a kit entirely from samples or mix and match with TR sounds for cutting-edge drum tracks that demand attention. Effects can make a difference between a simple beat and a genre-defying production. The TR-8S includes a powerful effects engine containing everything from subtle reverbs to shattering distortions and crushers. As well as a master effects control, each channel also has assignable CTRL knobs. All effects can be saved with your created kits so that your productions always performance-ready. Th TR-8S has eight separate analogue outputs, so you can process individual drum sounds through external effects or send them into separate channels of your mixer or DAW. You have total control as to which instrument goes to which output and on the subject of output, the TR-8S has built in high-resolution 24bit/96kHz digital-to-analogue converters for incredible audio quality. The Roland TR-8S Rhythm Performer Drum Machine contains spectacular potential and we're certain it's going to be responsible for a lot of new music. why not make it yours? Posted on 18/10/2018 by tabby easy to use even for a novice of electronic music like me.